Equine Chiropractor Demonstration during the NILE. 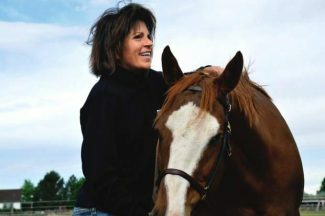 Friday morning, Oct. 16 Dr. Patricia Holl explains how to get horses bent back into shape at 9 a.m. in the Rimrock Auto Arena. Holl is a licensed chiropractor and is the staff chiropractor at the Yellowstone Naturopathic Clinic in Billings, Mont. She is an extension faculty member of the Intern Preceptor Program through Palmer Chiropractic College, Davenport, IA. Holl is also the instructor of the Animal Chiropractic courses at Southern California University of Health Sciences in Los Angeles and the newly created Bozeman Veterinary College. She is currently pursuing a Diploma in Functional Neurology through the Carrick Institute of Functional Neurology. She was recently published in the national publication of 'The Working Horse' magazine, and is a featured speaker at the American Veterinary Chiropractic Association national conference later this year in Albuquerque, New Mexico. Holl also maintains a busy animal chiropractic practice, specializing in equine chiropractic, though she also attends to dogs, cats, goats and an occasional rabbit. She travels throughout the country providing animal chiropractic services. This is a free event open to the public. For questions, contact Dr. Pat Holl at (406) 672-9116 or at drpholl@gmail.com.